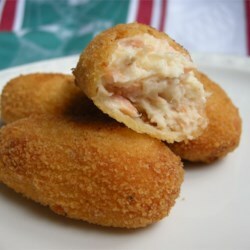 This Salmon Croquettes recipe from allrecipes.com looks and sounds too delicious to pass up for this week’s Scrumptious Seafood. Very simple and quick recipe (ready in just 20 minutes!) that was even described as elegant by one reviewer. Don’t have all the ingredients on the list? Check out the substitutions others have made or get creative with the contents of your fridge. We’d love to hear what changes you make! And don’t forget, we sell canned salmon in the Cannery Store! From Reviewer STROY21: These are wonderful. The recipe is very forgiving. I didn’t have green onion or wheat germ, so I substituted minced onion and breadcrumbs. I made them into patties and fried in the olive oil. They are even made better with the creamy dill dipping sauce from this site.